Bake a sheet cake the size that you need. Ice with white buttercream icing. Make the tombstones out of silver foam core board (found in any craft store). Cut 7 rectangles that are 4 inches x 2 inches. On some cut the corners off. Round off the edges by rolling against a table surface or other hard surface. Write RIP on the top front of the tombstones. You will be pushing them one inch to one and a half inches into the cake surface to stand them up. You can age the stone's surface by rubbing it with black food coloring or black icing. Place them on the cake as shown in the above picture. To make the grass, put some coconut in a plastic baggie with some green food coloring in order to color it green. 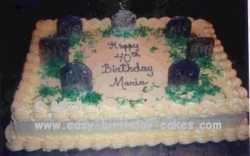 Sprinkle the green coconut around the tombstones that you placed on the cake. Write your birthday message in the center. Put a shell border around the top and bottom edge of the cake using an open star tip in whatever size you would like. If you need party favors for your party, try personalized candy wrappers such as these 50th Birthday Candy Wrappers They go great with this cake!